This entry was posted in Photography and tagged art, photo, winter. Bookmark the permalink. 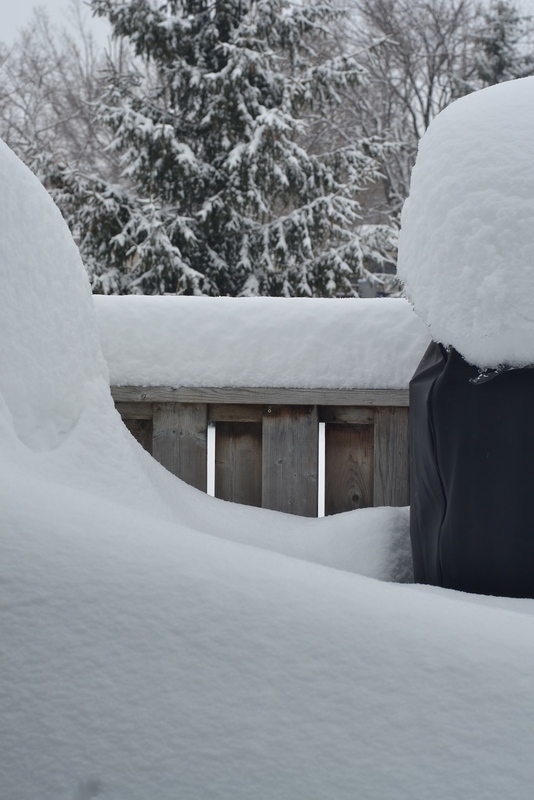 Yes it is… and I’m not shovelling the back porch until I want to BBQ some steaks. LOL good plan! We are getting ice today. its been a very wintry winter so far. Even before the storm this picture tells a story to those of us experiencing 40+Celsius heat today in Australia. A world of contrasts in so many ways. A beautiful photo. Looks beautiful! I’ve never seen that much snow with my own eyes! Watch for tomorrow’s post. I’m betting there’ll be twice that… if I can even see out of my window. High winds, snow squalls and -11Cels temps are expected. Not a good forecast for a drive through the countryside. I’m from a small island that doesn’t get much snow but we are currently being battered by ten foot waves! So not much going out here either – keep warm and looking forward to see the snowy pictures!